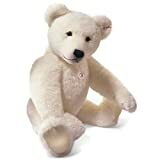 This beautiful polar bear is from the world-famous maker Steiff. The company has been making bears for more than a century and older models can often fetch large prices at auction. A Steiff new bear today will give pleasure to generations, and may even prove to be a good investment.